Size: Adjustable chain link bracelet up to 19 cm / 7.5 inches. Each charm is approximately 1 cm / 3/8" with a 1 cm / 3/8" clasp. 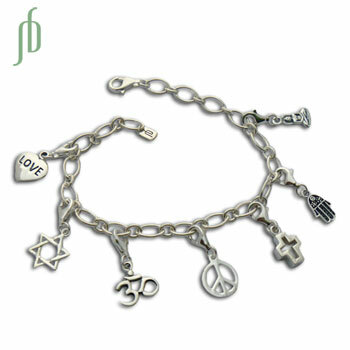 Coexistence charm bracelet with symbols and love, peace and spirituality/religion. The bracelet comes the following items: bs418 adjustable charmas base bracelet, ch383 love heart charm, ch387 star of david charm, ch341 om charm, ch370 peace charm, ch388 cut-out cross, ch358 hamsa or hand of fatima charm, and ch349 buddha charm. Shanti Boutique's Charmas, good karma charms collection is fun and easy to create your own combination of good karma symbols. Each charm has a spring clasp to easily take on and off. The charms can be worn all together, individually or in any combination. A portion of our profits is donated to the Tibetan Children’s Education Foundation (TCEF), an organization dedicated to the preservation of Tibetan culture in exile. To donate to TCEF directly or sponsor a child please visit TCEF's website. Orders are shipped within 1-2 business days (if in stock) from our own warehouse. Get your good vibes going with shanti boutique's Good Vibes seven chakra charm bracelet and SAVE 10%. This set includes seven chakra charms 1.2 cm, each made of sterling silver or gold vermeil and colored cubic zirconia with a spring clasp, one for each chakra.